Which came first, Louis L’Amour’s Hondo or the film starring John Wayne? What role do Ojibwe tribal traditions play in Louise Erdrich’s Love Medicine? 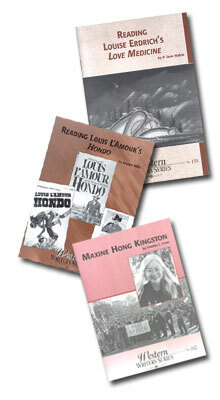 Does Maxine Hong Kingston write fiction, autobiography, or both? The 50-60 page booklets of the Western Writers Series provide answers to these and other questions about the American literary west. To choose from more than 140 in-print titles, browse our catalog. Jan 2014 – Western Writers Online begins posting links to online and offline sites useful to the study of western writers at http://www.westwriters.org/resources. Oct 2013 – Western Writers Online, a peer-reviewed journal and research hub, inherits the mission of WWS to provide accessible, authoritative scholarship on American western writers. Check us out at http://www.westwriters.org/. The Western Writers Series suspended print publication after 2006. We continue to sell in-print titles from our backlist and to offer free downloads of about a dozen out-of-print titles through the WWS Digital Editions. To reduce overhead costs, we currently sell our booklets “the old way” – with a phone call, fax, or letter to the Accounts Manager. See sidebar at left to contact us. Thank you for your interest!